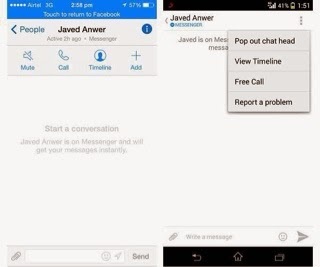 Facebook just launched free calling option to its users in the ‘facebook messenger’. Following features are Facebook messenger mobile apps now offer a Free Call button in the chat Window’s menu option in android and ‘I’ button in iphone located at the top right side. This feature is available on both ios and android and it works on 3g as-well-as wifi. Since, users don’t have to pay any charges but Facebook even have to pay to ‘Telecom service provider’. On android devices, the call is shows up like a normal phone call but in iphone it is donated by push notification. Calls can only be made between the users who have facebook app or facebook messenger app installed on their phones. Facebook first introduced its feature in January, 2013 at us and canada and it was extended to android in April, 2013. Note:- facebook call is not available im the web version of Facebook Messenger.